Prambanan Temple is the most beautiful Hindu's temple in southeast asia. The location is not far from Borobudur Temple, it shows harmony relation between the followers of Hindu and Buddhism in Java Island, not only in the past but also in the present. The local people over there calling this temple as Roro Jonggrang Temple and it also has a legend story. In the past, there was a powerful and sacred man which he want to married a beautiful princess named Roro Jonggrang. The king also as father of Roro Jonggrang pushed his daughter to marry with Bandung Bondowoso, but Roro Jonggrang didn't love him but she couldn't reject. After considering it for a long time, in the end she gave Bandung Bondowoso a requirement to built 1000 temples and must be built before the sunrise. Roro Jonggrang promised after the proviso is done and finished well, she will marry him. Roro jonggrang asked that his work must be finished before the chickens crow where she thought it is very impossible to done. But Bandung Bondowoso is very magical and he almost finished his work, built 999 temples assisted by many goblins and his strenght. Roro jonggrang knew that Bandung bondowoso almost finished his work then she asked women in her village to start hit the rices in order the chickens woke up from their dream and start to crowed. Bondowoso was very disappointed by what Roro Jonggrang did, then she converted into the last temple by Bandung Bondowoso and now known as Prambanan Temple, whereas many temples around it named Sewu Temple or one thousand temple. Prambanan temple is built in 9th century , devoted for Lord Shiva, the destroyer gods of universe and in right and left side devoted for Lord Brahma, the creator gods of universe. and Lord Visnu as the preserver of the universe. The highest temple is about 47 metre between another temples. Prambanan found back by a dutchman named SA Lons in 1773 after neglected for a hundreds years. 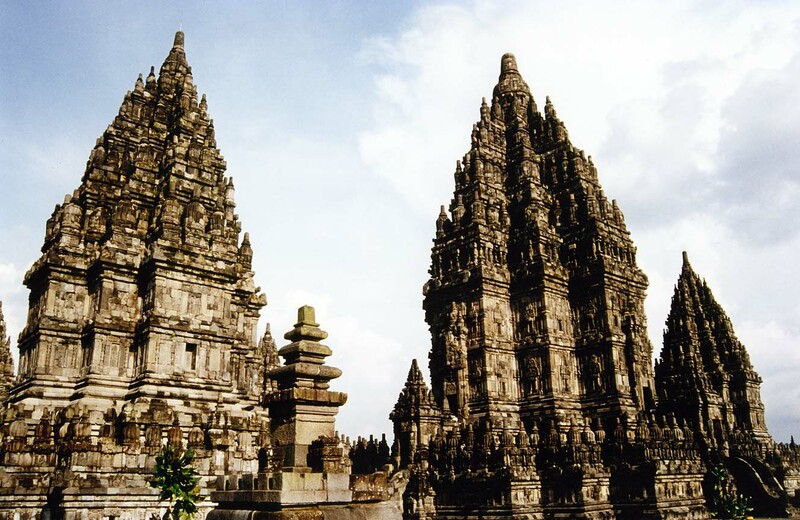 This temple has gotten restoration and now Prambanan Temple known as the most beautiful temple in Indonesia. The beauty and the complexity of Prambanan Temple as an awesome building which make UNESCO enthrone this building as one of world heritage site. Reliefs in Prambanan Temple tell us about the epic of Ramayana. There are many historical objects such as phallus of Gods Shiva as a symbol of fertility. Epic of Ramayana tells a story about Prince Rama and his wife, Sinta who are walking in the forest. Rama see a gold deer then he intend to hunt it, however before that he make a circle who surrounding Shinta. Rama said that she not allowed to go outside the circle in order her safety. But, the king of monster named Rahwana persuade Shinta to out of the circle, then he abduct Shinta and bring her into his palace, Alengka. Rama is grieved and he with The King of Monkey, Hanoman try to find Shinta. At the end, they find Shinta in Rahwana's palace. Then Rama destroy Alengka and Shinta succeed rescued and back to Rama, her husband. As long as you in Prambanan Temple, as much as possible you can capture a lot of photos you want because the beauty of scenery from the temple which stand solidly and many ruins of the temple. The ticket that you paid can be used for a full day, it is mean you can enter and exit the area of Prambanan anytime in that day. For the photographers, you can capture many photos as you can in different time in a day. It is very interesting ! The closest cities if you wanna go to Prambanan is Yogyakarta city and Semarang city. Garuda Indonesia Airlines, Mandala Airlines, Merpati Nusantara Airlines, and some airlines fly to these cities from Jakarta or another great cities in Indonesia. From Yogyakarta, you can rent a car to go to Klaten. In klaten, you can continue your travel to Prambanan Temple. If you're tired to walk, you can use "becak", a traditional three-wheeled vehicle by the cost approximately Rp 10.000,00. And you will be brought directly into temple's entrance, not far from the place you buy a ticket. The best way to explore Prambanan Temple is by go on foot while you enjoying the scenery of architecture and the beautiful temple design. The wide of area of this temple about 39,8 hectare. In the primary yard there are 3 kind of temples, 3 Wahana temples, and 2 Apit temples and 8 Patok temples which surrounded by fence. In the second yard, there are 224 Perwara temples. Enjoy the scenery by stroll freely, explore the reliefs will make you amazed. If it compared with Angkor Wat, Prambanan Temple is easy to explored and understood by the visitors. The area around Prambanan is developed by adding green park and souvenir shops. Because of Prambanan is not located in remote village, the greatness of this temple will make you forget that you are in the city. You will brought into the past where the ritual and its culture dominate every part of society life. There are some hotels and inns that you can choose in Yogyakarta city. If you want the luxury touch, try to stay overnight in Sheraton Mustika Yogyakarta Resort and Spa. It's located near the airport and has a big swimming pool, souvenir shops, entertainment places and food. Hotel Hyatt is another luxury hotel you can choose besides Hotel Sheraton Mustika. Many hotels near Yogyakarta which will offer you classy restaurant atmosphere with some western food and Yogyakarta traditional food.